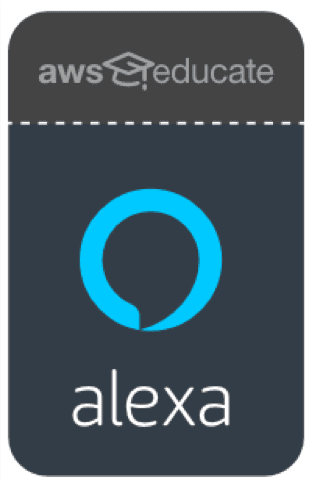 The Alexa Skills Badge – with 10-15 hours of dedicated Alexa skills training to help you every step of the way. Scroll down for more info! Never built a skill? No problem. The Alexa Badge for AWS Educate has 10-15 hours of dedicated Alexa skills training to help you every step of the way. Alexa is Amazon’s cloud-based voice service and the brain behind tens of millions of devices like Echo Show and Echo Spot. You can build capabilities, or skills, that make Alexa smarter and make everyday tasks faster, easeir, and more delightful for customers. There are now tens of thousands of skills from companies like Starbucks, Activision, Uber, Sony Pictures Television, Domino's,and Capital One, as well as other innovative designers and developers.